An hourglass shape may be the ideal, but American women are far more likely to be pear- or rectangle-shaped, reported SizeUSA after examining the body types of over 10,000 people in 2004. According to fitness instructor and author of "The Waistline Plan" Sally Lewis, the key to losing inches around your waist and developing an hourglass figure is to base your diet on unprocessed complex carbohydrates, lean proteins and plenty of fruits and vegetables. While Lewis' plan might help you lose weight overall if you're controlling your calories and reducing consumption of fat and sugar, it's not possible to exclusively target your waist with diet. Ask your doctor or a dietitian for help if you're having trouble designing a diet that helps you achieve sustainable weight loss. Breakfast might feature a glass of fruit juice and breakfast cereal or cooked oatmeal. Choose only 100 percent fruit juice and low- or nonfat regular or plant milk to avoid the extra calories contained in sweetened fruit drinks or whole dairy. Pick a ready-to-eat cereal that has 3 or more grams of dietary fiber and less than 240 milligrams of sodium and 7 grams of sugar per serving. For a heartier breakfast, pair a poached egg with whole-wheat toast, fruit juice and low-fat yogurt. Don't eat out or rely on ready-made food for lunch, advises Lewis. Planning ahead for a balanced, homemade meal at lunchtime can keep your fat, sugar and sodium intake low. Try a whole-wheat pita filled with turkey, tuna or salmon salad made with chopped vegetables and reduced-fat mayonnaise; an omelet filled with sauteed vegetables and served with a green salad; or whole-grain pasta tossed with steamed vegetables and toasted nuts such as walnuts. Eat few, if any, refined-grain products like white bread, regular pasta or white rice, which can cause spikes in your blood sugar that may leave you feeling hungry. A typical dinner might consist of grilled steak, steamed vegetables and brown rice, poached salmon with vegetables or a tofu stir-fry. 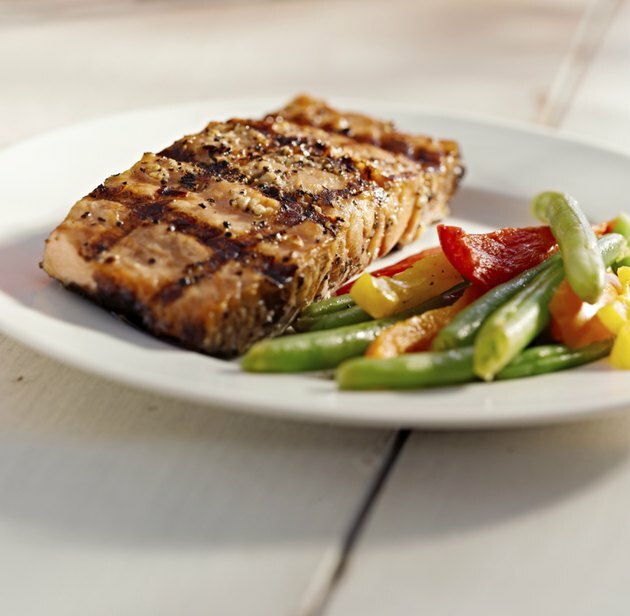 Pick skinless poultry, omega-3 fatty acid-rich seafood, beans and legumes more than often than red meat as your protein sources. When you do have meat, look for lean cuts that have fewer than 10 grams of total fat and no more than 4.5 grams of saturated fat in every 3.5-ounce serving. Don't deep-fry, and avoid breaded meats or entrees topped with cheese, gravy or heavy cream sauces. Likewise, serve cooked fresh or frozen vegetables with as little added fat as possible. Skip the cake, pie, cookies or ice cream for dessert in favor of fresh fruit. Eat at regular times throughout the day while you're on a diet. Lewis says doing so will keep hunger at bay and ensure that your metabolism is functioning at a consistently high rate. Well-chosen snacks -- one planned for midmorning, the other for midafternoon -- can help you do this. Good options include a low-fat bean dip like hummus paired with raw vegetable sticks, brown-rice cakes spread with low-sugar nut butter, whole fruit, or raw nuts such as almonds. Watch your portion sizes: Too much of even a healthy snack can make weight loss harder if you're consuming more calories than you need. CNN: Can You Really Control Where You Lose Fat?